Summer is a great time to get exercise. The sun is shining, the pool is sparkling and summertime classics like baseball and beach volleyball await. However, summer is also prime time for exercise-related injuries. Making an exercise mistake can derail your whole summer, keeping you out of commission for your favorite activities. Our sports medicine experts recommend the following tips to exercise smart this summer. 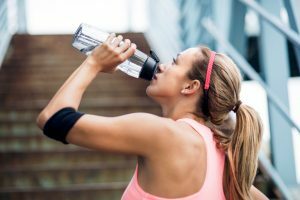 Heat-related injuries are a common cause of exercise problems in the summer weather. Remember to stay well hydrated to avoid heat stroke, particularly if you are competing in an event. Drink plenty of water before beginning any exercise, and continue to take small sips of water throughout your workout. Avoiding alcoholic or carbonated beverages is a good strategy for staying well hydrated. Summer is a great time to start a new exercise routine because there are hundreds of options for outdoor activities. If you do start a new activity, make sure you take a gradual approach. Quickly ramping up in frequency or intensity can result in injury. Take things slowly to ensure your body has time to adjust. Overuse is one of the most common causes of injury among active people. It can be particularly problematic in the summer when nice weather may cause you to want to run extra far or extra often. When building your training plan, remember to add rest days and stick to them. Listen to your body, slowing your pace or stopping entirely if you notice something is amiss. Wearing light colored clothing keeps you from getting overheated. Choose a lightweight synthetic fabric that wicks sweat away from your skin to stay cool. Depending on the intensity of the heat in your region, you may need to adjust your workout time based on the thermometer. Because the days are longer, summer is a great time to take advantage of early morning or late evening workouts. Following these exercise tips is a great way to lower your risk of injury this summer. If you do experience an exercise-related injury, make an appointment with our orthopedic doctors at Southeast Orthopedic Specialists. We will work with you to create an individualized treatment plan that gets you back to the activities you love as soon as possible.